Addis Ababa University, in a special ceremony on Thursday 24th of July, 2014 has conferred an Honorary Doctorate Degree upon Mr. Bill Gates, Co – Chair of the Bill and Melinda Gates Foundation .The ceremony held at the Nelson Mandela Hall on the Main Campus of the University. Guest of Honor of the ceremony H.E. 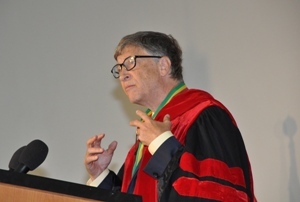 Ato Hailemariam Desalegn, Prime Minster of the Federal Democratic Republic of Ethiopia has handed out the honorary doctorate degree and award and hooded Mr. Bill Gates. 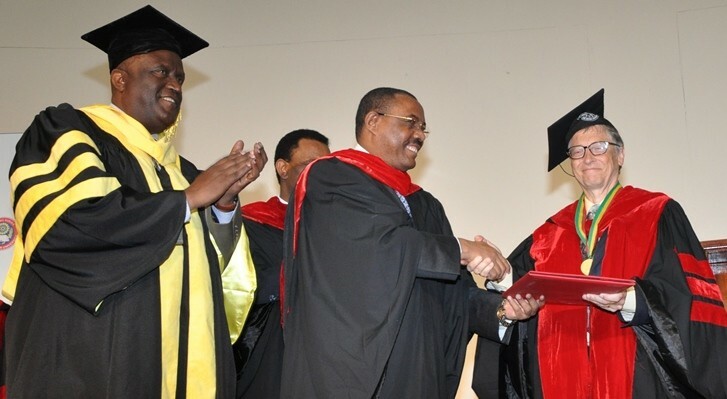 Admasu Tsegaye (PhD), President of Addis Ababa University, in his opening remark said the conferring of an honorary degree upon Mr. Bill Gates certainly confirms the University’s commitment to standing for the disadvantaged, the sick and the victim of poverty. He further stated that the conferring of honorary degree upon on him encourages both the university and the awardee to work jointly towards improving livelihood of our society. Organized to recognize and honor his openhanded philanthropic works and his innovative technological contributions towards creating a better world, this honorary conferral ceremony has featured acceptance speech of the awardee and question and answer session with the audience. The ceremony has also hosted a separate roundtable discussion of Mr. Bill Gates with students, held at Rass Makonnen Hall. Guided from an early age by a belief in the power of software and personal computers to improve people’s lives, Bill Gates co-founded Microsoft and helped foster a technology revolution that continues to this day. Years before other companies focused on corporate philanthropy, he encouraged Microsoft and its employees to use technology to empower people, and to give back to their communities. In 2000, Bill Gates and his wife Melinda created the Bill & Melinda Gates Foundation, the world’s largest philanthropic organization, focusing on reducing poverty and improving health and economic opportunity in Sub-Saharan Africa and South Asia, as well as on giving young people in the United States access to a good education, regardless of their family’s income level. Since the foundation’s inception, it has contributed more than US$30 billion in support of charitable initiatives around the world. In recognition of his philanthropic and technological contributions to creating a better world, he received numerous awards, honorary degrees and the Time Magazine identified him in 1999 as one of the 100 most influential people of the 20th century. Higher government officials, ministers, diplomats, the university community and invited guests have attended the event. Apart from our national media, correspondents of a number of international media including the CNN, CCTV, Xinhua, Associated Press, and Agence France Presse have aired this event for the international community.